Skateboard shoes have gone through quite some changes over the last few years. 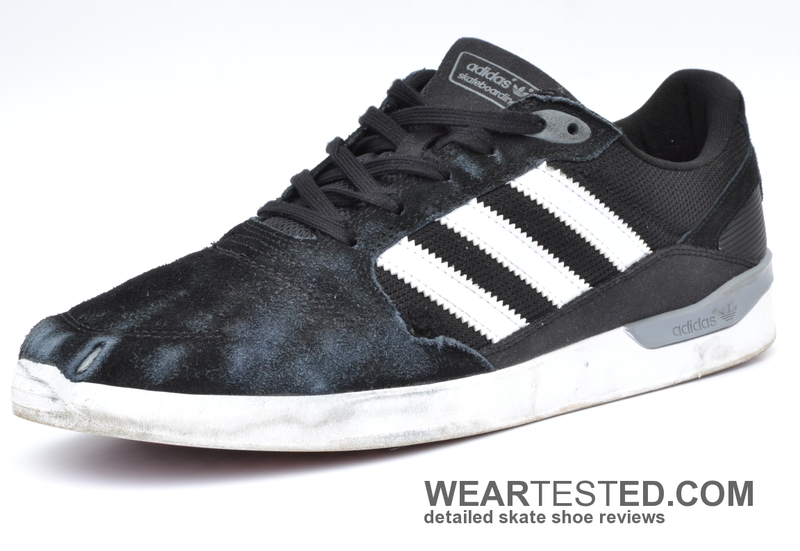 It’s not often that we can actually spot a design that can’t be categorized into the “slim vulc, black upper with white sole“ niche. Yet when we do, it is a very welcoming change for both brands and shoe designers alike and can lead onwards to inspire more interesting new designs. One new source of inspiration are running shoes from both classic and modern eras. Adidas chose to go the classic route and selected one of their most iconic models, the ZX 750, to be revamped. Adidas Footwear Designer Jesse Rademacher had the honor of adapting the running icon for skateboarding, thus creating the ZX Vulc. 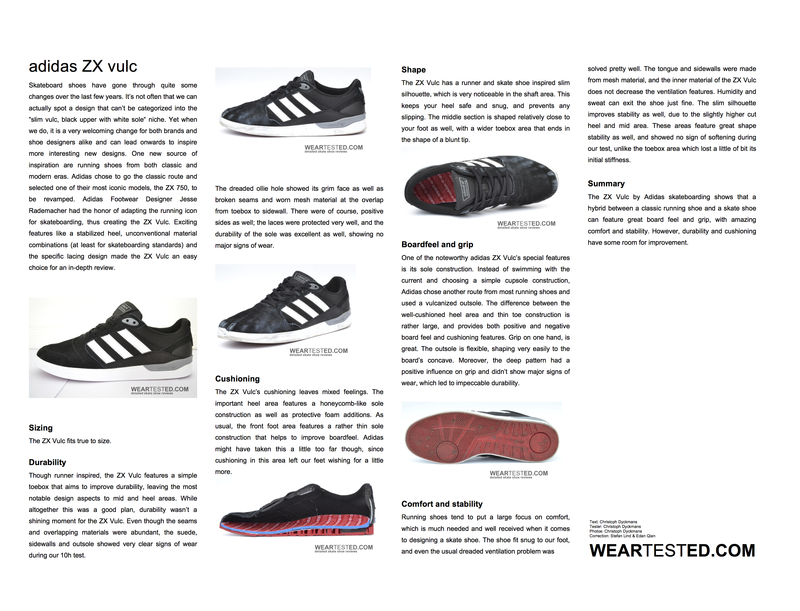 Exciting features like a stabilized heel, unconventional material combinations (at least for skateboarding standards) and the specific lacing design made the ZX Vulc an easy choice for an in-depth review. The ZX Vulc fits true to size. Though runner inspired, the ZX Vulc features a simple toebox that aims to improve durability, leaving the most notable design aspects to mid and heel areas. While altogether this was a good plan, durability wasn’t a shining moment for the ZX Vulc. Even though the seams and overlapping materials were abundant, the suede, sidewalls and outsole showed very clear signs of wear during our 10h test. The dreaded ollie hole showed its grim face as well as broken seams and worn mesh material at the overlap from toebox to sidewall. There were of course, positive sides as well; the laces were protected very well, and the durability of the sole was excellent as well, showing no major signs of wear. The ZX Vulc’s cushioning leaves mixed feelings. The important heel area features a honeycomb-like sole construction as well as protective foam additions. 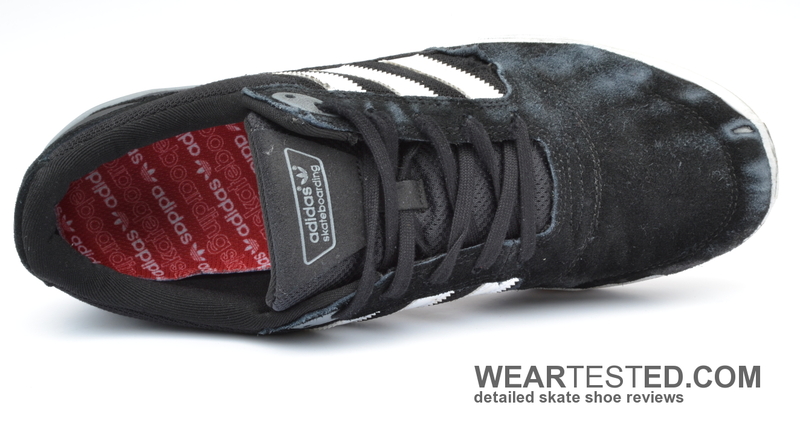 As usual, the front foot area features a rather thin sole construction that helps to improve boardfeel. Adidas might have taken this a little too far though, since cushioning in this area left our feet wishing for a little more. 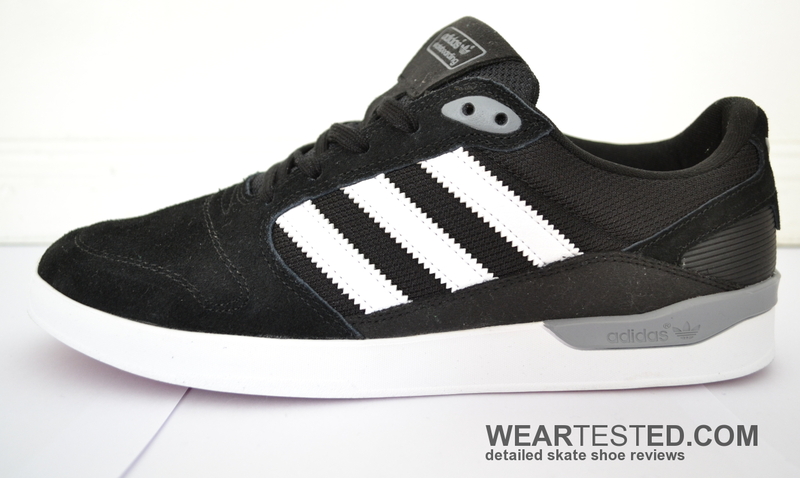 The ZX Vulc has a runner and skate shoe inspired slim silhouette, which is very noticeable in the shaft area. This keeps your heel safe and snug, and prevents any slipping. The middle section is shaped relatively close to your foot as well, with a wider toebox area that ends in the shape of a blunt tip. One of the noteworthy adidas ZX Vulc’s special features is its sole construction. Instead of swimming with the current and choosing a simple cupsole construction, adidas chose another route from most running shoes and used a vulcanized outsole. The difference between the well-cushioned heel area and thin toe construction is rather large, and provides both positive and negative board feel and cushioning features. Grip on one hand, is great. The outsole is flexible, shaping very easily to the board’s concave. Moreover, the deep pattern had a positive influence on grip and didn’t show major signs of wear, which led to impeccable durability. Running shoes tend to put a large focus on comfort, which is much needed and well received when it comes to designing a skate shoe. The shoe fit snug to our foot, and even the usual dreaded ventilation problem was solved pretty well. The tongue and sidewalls were made from mesh material, and the inner material of the ZX Vulc does not decrease the ventilation features. Humidity and sweat can exit the shoe just fine. The slim silhouette improves stability as well, due to the slightly higher cut heel and mid area. 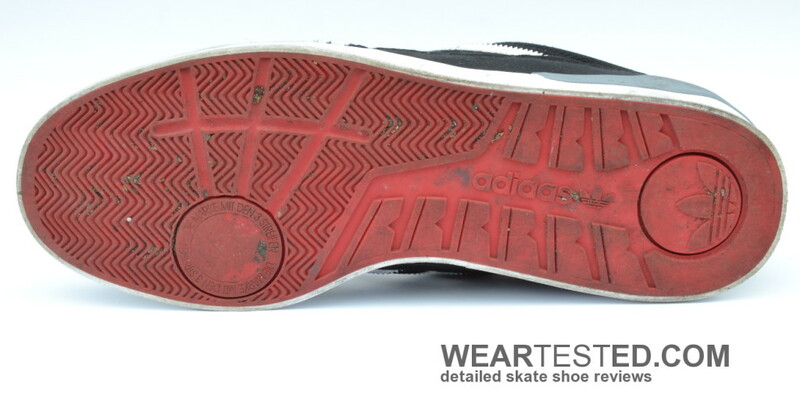 These areas feature great shape stability as well, and showed no sign of softening during our test, unlike the toebox area which lost a little of bit its initial stiffness. 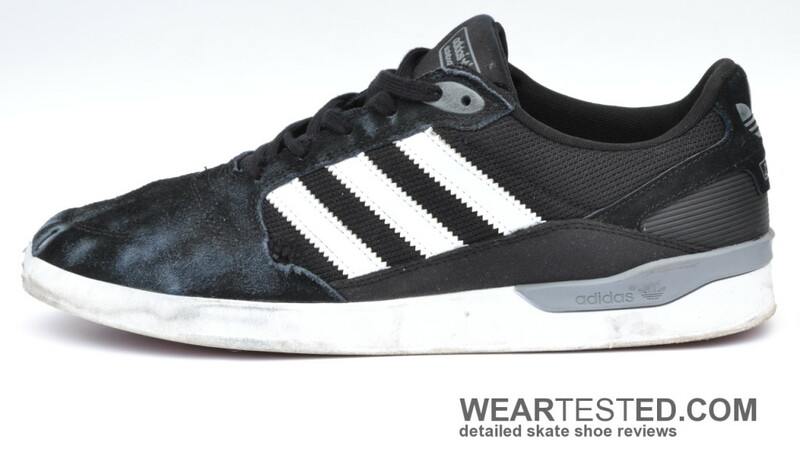 The ZX Vulc by adidas skateboarding shows that a hybrid between a classic running shoe and a skate shoe can feature great board feel and grip, with amazing comfort and stability. However, durability and cushioning have some room for improvement.